One of the more remarkable developments in world golf, the Stone Forest International Country Club is a 54-hole facility that was, quite literally, carved from a world heritage listed National Park. That National Park is the Stone Forest of Shilin-Lunan, in the autonomous county of Lunan Yu in Yunnan Province, around 75 miles east of Kunming. The Stone Forest area covers approximately 150 square miles and is rightly protected under a UNESCO World Heritage listing for its enormous limestone formations. Stretching as far as the eye can see, these prehistoric monolithic remnant stones and boulders rise more than 100 feet in places, and are integral to the design of each of the three courses. Architect Brian Curley was the man responsible for all 54 holes at Stone Forest. Logistically, this was among his most difficult projects, as the demands upon his design and construction teams were substantial. For a start he had a client who wanted all three courses built at breakneck speed. There was also the issue of the rock, and lots of it. In large areas blasting was prohibited, so huge chunks had to be either jack-hammered by hand or somehow incorporated into the various routings. 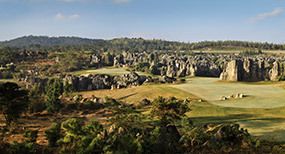 The resultant mix of open areas and holes within the rock is what makes Stone Forest so unique. Credit must go to Curley here, for being able to create three courses with their own distinctive personalities and for designing as many interesting holes as he did amongst the earthworks and the unmovable obstructions. There is no doubt that in places he would have preferred to move boulders around, but these were no ordinary rocks. With so much eye-candy on display, these are no ordinary golf courses either. 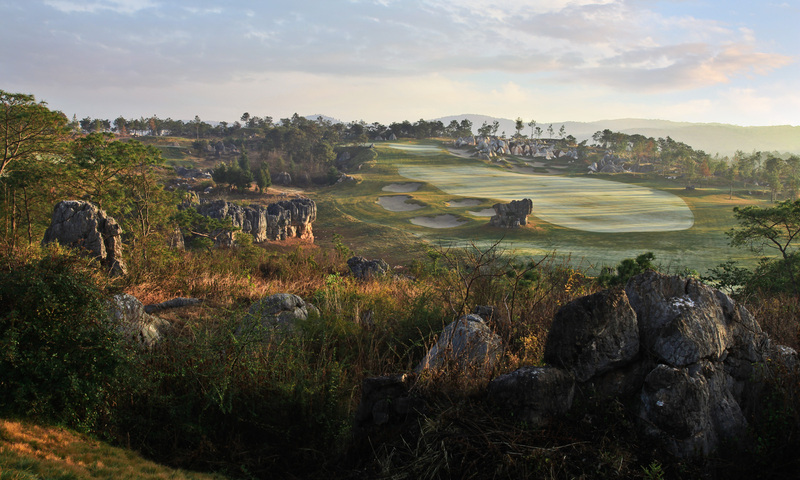 Reserved exclusively for member use, the Leaders’ Peak Course occupies the most usable golf terrain on the property, and houses some of the standout stone formations. Visitors lucky enough to get onto the course will certainly remember the rock holes on the back nine, but in many ways it’s the earlier, softer holes through the front half of the course that make the layout impressive. 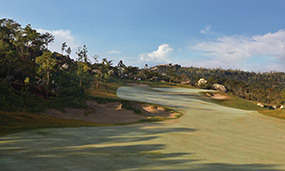 These opening holes are defined by their pleasant golfing undulations along with their secluded pine forest setting. They also boast terrific green complexes that meld easily within the surrounding terrain. From gently leaning targets at the 1st and 2nd to perched greens on the 5th and 6th, these are mostly subtle putting complexes that work to both complicate anti-strategic play and reward those good enough to properly control their ball. Few would nominate any of these early holes as standouts, given the drama of the back nine, but the twice-twisting par five 4th is as good as anything at Stone Forest. So too is the doglegging par four 8th, with its cleverly positioned central fairway bunker and an elongated green site pushed back within a cluster of rock. The beauty of the setting here together with the simplicity of the design makes the 8th an immensely satisfying golf hole. Once the golfer steps across to the inward nine, the strategic simplicity of the outward holes quickly make way for the sheer audacity of a back nine dominated by extravagant rock formations incorporated into the likes of the 11th, 12th, 14th and 15th. These are some of the most daring golf holes in the world. The most memorable is unquestionably the 11th, a genuine signature short par four surrounded by some of the tallest stone structures on the property. 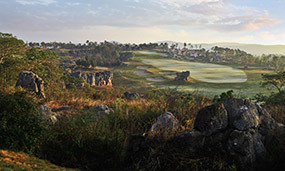 While the very long hitter may be able to attack the green from the tee here, for most golfers this is an iron-wedge hole made memorable by a very cool walk amongst the giant limestone. There is no other hole in golf quite like it. The next is equally distinctive, though much more intimidating. Stretching 200 yards from the tips, this spectacular par three plays to an apparent island green floating within the rock. Although undeniably beautiful, the majority of local players are sure to struggle with this tee shot. More impressive, from a traditional golfing perspective, are the likes of the undulating par four 16th and the gently rising par five 18th. Arguably the best hole on the back nine, however, is the mid-length 15th, with its central cluster of stones forcing golfers to either choose the safer, longer left-hand side from the tee, or the more dangerous, but shorter, right side. 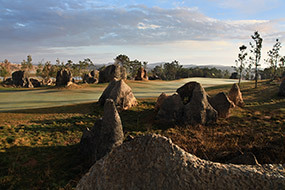 There is no doubt that golfers lucky enough to play the Leaders’ Peak Course at Stone Forest will enjoy the experience. Whether it’s the pronounced stretch of high-quality holes through the front nine or the sheer thrill of golfing amongst the enormous boulders of the back nine, this is not a golf course you are ever likely to forget.